You’ll encounter rainy conditions every now and then during a round of Golden Tee. Contrary to what you might think, rain does not slow the ball down in the air after your shot. Rain takes effect after your ball hits the ground, as it slows the surface, causing your ball to roll less than it would on a dry surface. 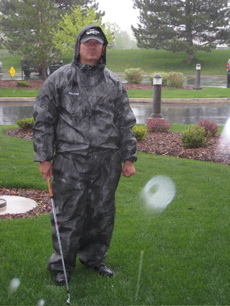 So, the biggest tip while playing in the rain is to anticipate the reduction in roll after your ball lands! You should club down a bit from the recommended distance due to the still-normal air time.